Criteria include my personal taste but also the value for money, experimentation in distillation/maturation techniques, packaging and overall impression. Teeling Revival Vol. V ♥♥♥♥ –> APRIL HIGHLIGHT! Teeling definitely are masters of their art when it comes to cask finishing… Sweet, creamy, fruity and a whole tray of warm French pastries straight from the oven! Delicious. It’s nice, that’s about it. I didn’t know what to expect of this unusual Texan whiskey made from blue corn, I have never had blue corn as a dish nor in a distilled spirit 😉 What a pleasant surprise! You know I like off-the-beaten-tracks drams, and this little one is just that! The texture is surprisingly thick and the notes of caramel-coated bananas are just insane. The price is high (around 350€) I have to reckon, but it actually does make sense for a collectible anniversary bottling, especially as the liquid inside has nothing to be ashamed of. A sherried Benromach boasting delicious notes of fruit cake, red berries, ginger, brown sugar and toffee. A yummy offering from the Speyside distillery ! Probably the most stunning dram I had this year so far, yet there’s little chance you can find it and if you do, it would be bloody expensive, so I have to restrain myself from giving it the Highlight title 😉 – A beautifully rich, thick and complex dram with plenty of tropical fruits, sherried aromas, red berries jam and oaky notes. No wonder 1976 vintages from Tomatin are so sought-after ! Redbreast Dream Cask 32 ♥♥♥♥ –> MAY HIGHLIGHT! 816 bottles of this liquid gold were released on World Whisky Day 2018 (sold out obviously), at 500€ – I had the chance to receive a sample from the awesome folks at Irish Distillers and oh boy, this “dream cask” was dreamy indeed! So complex and balanced, and rich and beautiful, and stunning and wow that tasting notes wouldn’t do it justice. A mind-blowing experience. I’m glad this new 10-year-old PC is joining the permanent Bruichladdich offer – the new design is debatable, some have been saying it looks like a box of sport protein product, yet I think I quite like it, especially as it really stands out on a shelf, it’s modern and bold – exactly like Bruichladdich’s approach to whisky. The liquid inside doesn’t disappoint as well, it’s finely balanced, rounded, oily, rubbery with a smack of peat in your face complemented by roasted pineapples and peppercorns. 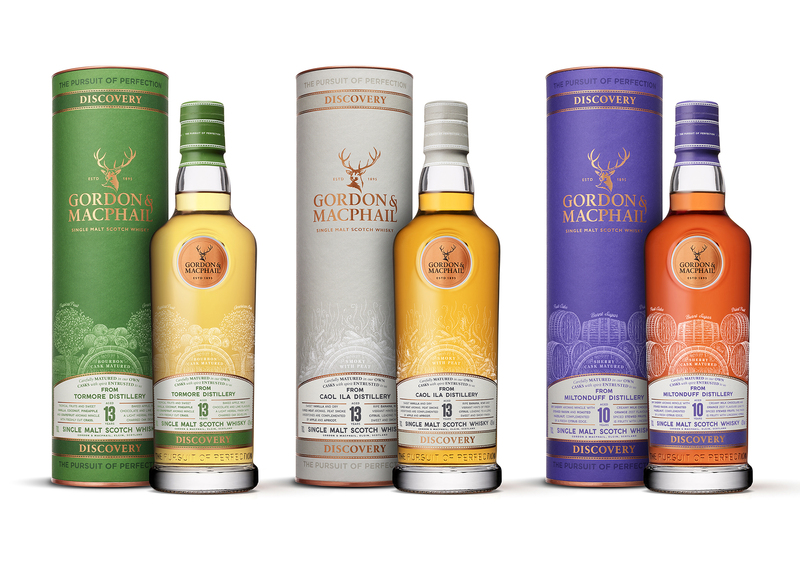 “Family-owned single malt Scotch whisky creators, Gordon & MacPhail, has announced the launch of ‘Discovery’, a new range that is part of the company’s commitment to strengthen and streamline the brand’s portfolio. The range of carefully selected whiskies is grouped and colour-coded under three flavour profiles – ‘Smoky’, ‘Sherry’ and ‘Bourbon’. –> Miltonduff 10 ♥♥ : Hi there sherry ! Well, a rich and sweet sherried dram boasting the obvious sherry notes it is supposed to: plenty of dried fruits, chocolate, christmas cake, ginger bread, spices, toffee… You get it right? –> Caol Ila 13 ♥♥ : A great introduction to peaty/coastal whiskies, it’s deliciously smoky but the peat cloud is balanced by sweeter aromas of ripe banana, sweet spices and apricot jam. –> Blablair 12 ♥♥♥ : a rather fresh, light and fruity dram with plenty of orchard fruits, citrus and floral notes. Very approachable and enjoyable, a perfect beginner dram and something to sip anytime you wish to relax without necessarily overthinking what’s in your glass. –> Tormore 13 ♥ : probably the slight disappointment of the range, although disappointment is a strong word, it’s an ok whisky, I would have no problem enjoying it after a long day on my balcony, but that’s it, it’s light, cereal-forward, fruity and floral, but there’s nothing that actually says “one more sip!” in there.